Very well situated in a quiet place, very near to the Pena Palace, the Moorish Castle and the historic town of Sintra, ideal for a great holiday of nature walks, golf, various sports, beach and cultural events. Guests are welcomed to the owners house beautiful garden. Cleaning service included at check in and out. New linen and towels every 7 days of stay. Possibility to host up to 6 people (sofa bed in the room for a couple) and to provide a baby bed with linen and a baby chair (surcharge of 10 E per day). As a university professor and director of cultural institutions, I always lived in Portugal most beautiful places, such as Evora and Chiado in Lisbon. Retired, I choose São Pedro de Sintra to live, to welcome my family, friends and the guests in the the cosy cottage nearby. I fall in love with the place, the gorgeous garden, the charming house and because we can stay here with the best life quality, near to everything, but returning home to live the tranquility and beauty of nature. My best place for holidays all my life, and now the best to live. The garden itself is overwhelming. The quietness of the environment, the walking distance to all facilities, the accessibility to Lisbon, Estoril, Cascais, being back home with tranquility and rest in the garden loan with no noise, walking around and enjoying nature, is all we need to have wonderful holidays. We had a wonderful stay at Casa Pequena da Panalva. The two bedroom house is charming, clean and cosy and has everything you will need for a comfortable stay and self catering. We were three adults staying at the house. 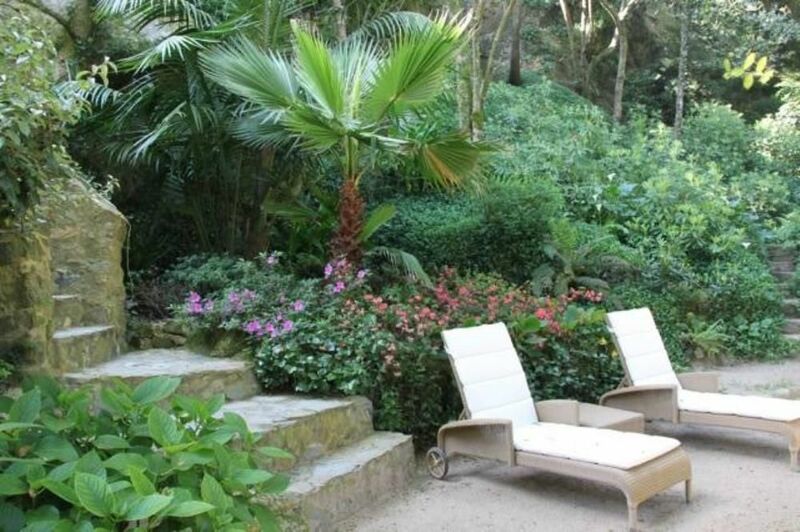 Visitors are allowed access to the owners'' wonderful shady garden , a beautiful place for a glass of wine on a hot afternoon.The house is in a delightful location, with lane ways leading you on a short walk to Sintra and it''s many charms, including its castles and palaces. As the Casa is located right in Sao Pedro, you can shop locally, have a delicious morning coffee and cake a few minutes walk away and eat at one of Sao Pedro ''s restaurants after a day out. The accommodation matched the description, and lived up to our expectations. The owners live nearby and are very helpful and kind. Christine and David, Melbourne , Australia. August 2012." "It was my one of the favourite houses I ever rented. The house was very nice, with enough room for whole group (4 people). Also it had everything necessary, even hair drier! What I liked the most, was the quiet area, but at the same time very close to centre of the Sintra, Castelo dos Mouros, Palácio da Pena(10-20min walks). And in front of the house we had enough room to park 2 cars. The owner was very helpful and showed us where to get to the main attractions". Nous avons passé une très bonne semaine de vacances avec nos deux enfants de 5 et 8 ans. Le logement convient très bien et est charmant, situé au cœur de Sintra, dans une zone très agréable, proche des restaurants avec une ambiance de petit village. A noter que le palais de la Pena est accessible à pied depuis la maison. Le jardin est réellement superbe, avec ses cachettes, ses fougères. Les enfants ont adoré jouer aux exploratrices, et les adultes ont adoré flâner dans cette ambiance bucolique. Seuls petits détails au niveau de la maison : pas de lit double pour nous, mais deux lits simples et difficile de trouver une place pour la voiture à coté certains jours. A noter la gentillesse de Maria Jose, que nous n'avons malheureusement pas pu rencontrer. The place is very well located so it allows you to walk to Sintra and visit different castles which are marvellous ones. I would recomment Quinta da Regaleira and Sintra Castle. The restaurants nearby are not tasty but rather tourist oriented. We would advise you to eat where the portuguese go that is in some villages or little local towns. Then you will experience the real portuguese atmosphere and have nice meals. There are some local little portuguese shops where you can buy tasty fruits and vegetables. The garden is wonderful though you have to go out of the house in the street to get there. It is next door but it means you can't have your meals there. So, it was disappointing. When we got the abritel receipt, the owner told us we shouldn't take into account the discount awarded on the receipt, so we had to pay more than the receipt stated. It would have been wiser for the owner to deal with abritel before rather than dealing with us and tell us no discount was available. I would advise this place for 3 to 4 people. All in all we had a great stay because the place is very quiet and within a walking distance of wonderful places. I am sorry concerning the confusion around an eventual discount. I never said I will do any discount. The price is stated in the site/Homeaway, not Abritel ( I do not know this site and never discuss the issue) . It was the reason I told C D to talk with Abritel. I only received the price established by me in the site I pay for the announcement: Homeaway. Super emplacement, a quelques pas du centre historique de Sintra et a quelques minutes de marche du Palais De Peña et du chateaux des Maures. Nous avons passé une semaine magnifique dans cette location, accueil de Maria et Eddy fantastique, le jardin est fabuleux....WOW . La location offre tous le matériel nécessaire pour un séjour agréable. Nous vous recommandons fortement cette adresse. Claire, Marc et Félix ont etê des hôtes super. Trés sympatiques, on profité de tout de que la région, la maison et le jardin peuvent offrir de mieux pour des vacances heureuses. En plus, on laissé la maison trés netoyé. Des hôtes a recommender et a recevoir une prochaine fois! Essential visits to the Park and Pena Palace, Moorish Castle, Palácio da Vila, Regaleira Estate and Monserrate Park. The house is located right in the path of pedestrian trails of Serra de Sintra and close (by car) from well-known beaches such as Praia Grande, Praia das Maçãs, Adraga and Guincho. Excellent Restaurants in SÃ£o Pedro, Sintra, Colares, Almoï¿½ageme, Praia das Maçãs, Azenhas do Mar, Cascais and Estoril. Excellent golf courses nearby, among others, Penha Longa, Beloura, Estoril,Quinta da Marinha and Oitavos. During summer, there are many cultural activities: the Festival of Music and Dance of Sintra, parties, festivals and fairs, the best of wich is S. Peter Fair at the end of June. At Centro Cultural Olga Cadaval, in Sintra, there are a succession of exhibitions and performances throughout the year. Do not miss: the trip in the old tramway to Praia das Maçãs and in the horse-drawn carriage to see the historical streets and "quintas", the Toy Museum and the local gastronomic specialities, mainly the famous "queijadas de Sintra". The various addresses are available on a file at the house.